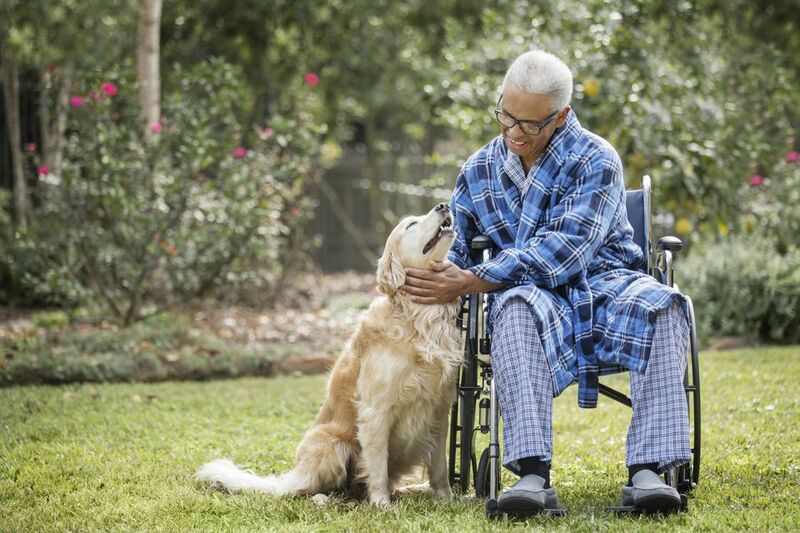 Therapy dogs bring a lot of joy to people in hospitals, nursing homes, and other places. It's a way for you and your dog to give back to your community together and many teams get as much enjoyment out of it as the people they visit do. Do you and your dog have what it takes to be an animal-assisted therapy team? The ideal therapy dog is well-trained, well-socialized, and truly loves people. A therapy dog must also be able to adjust well to new environments while staying attentive to their human handler. Any breed of dog—large and small—can take on this important role and you can help out and become your pup's handler. If it's of interest to you, it's important to understand what's involved in the process. Therapy dogs work with a dedicated handler. Quite often, this is the dog's owner, but that's not always the case. You might, for instance, think your dog would be a great therapy dog but don't feel you have the time to dedicate to it yourself. In this instance, another handler can take your dog through the program instead. If you want to be part of the therapy team with your dog, you must both complete a thorough training process. A great way to begin is to participate in the AKC Canine Good Citizen Program (CGC). This certification shows that your dog is socialized, friendly, and has adequate basic training. In fact, CGC certification is a prerequisite for many therapy dog programs. You should also develop your dog's training and proof its behaviors very well. Your dog must be able to stay relaxed and happy amidst loud noises, movement (of both people and objects), all kinds of medical equipment, and any other potential distractions. Most of all, you should always be able to get and keep your dog's attention whenever needed and in any environment. You may wish to find a therapy dog training class run by an experienced, knowledgeable dog trainer. While you are training your dog to become the ideal therapy dog, start researching official animal-assisted therapy organizations. Two internationally recognized groups are Pet Partners and Therapy Dogs International. Many cities and regions have their own therapy programs, so do some research into what's available around you. Keep in mind that each animal-assisted therapy group is a little different. Learn about the groups and find out which seem to be the best fit for you and your dog. Each group has its own set of standards, required courses, and special testing before a dog and handler can become a registered therapy team. The various groups will also have different therapy programs available in your area. Your choice may be influenced by where you and your dog could go. For instance, you may prefer a group that focuses on nursing homes or one that regularly visits schools. Therapy dogs must also meet specific health requirements, for both their safety and that of the people they will visit. At the very least, your dog should have current vaccinations, be on routine heartworm and flea prevention, and have a clean bill of health from your veterinarian. Once a dog and its handler complete all the requirements, they must go through a final evaluation, or series of evaluations, to become an official animal-assisted therapy team. The process can be very involved and sometimes quite difficult. However, many dedicated handlers and their dogs find that it is all well worth it in the end. As much as you may hope that your pup becomes an amazing therapy dog, not all dogs will make the cut. Each dog is different, so don't be disappointed if yours doesn't make it through training. Sometimes it's found during training that a dog does not have the right temperament or attention span to handle the job. It's also common to find dogs who may not have the desire to spend that much time with strangers or become easily startled in certain environments. For others, a previously undetected health condition, such as vision or hearing problems, may be a reason to stop the training. On the other hand, if you do become a therapy team, you can begin visiting facilities scheduled through your chosen organization. This is going to be the ultimate test of your dog's behavior in real-world settings. After you get out there and start making a difference, you'll be glad you took the time to go through the process. You and your well-trained pup will bring smiles to countless of faces and do a lot for cheering people up who may need it most.